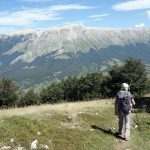 Our previous visits to Maiella have focused on Monte Amaro (2,793m), its highest peak and the second highest mountain in the Apennines after Corno Grande (2,912m). But there is another peak, Monte Acquaviva (2,737m) that is almost as high and, in fact, more commonly climbed. 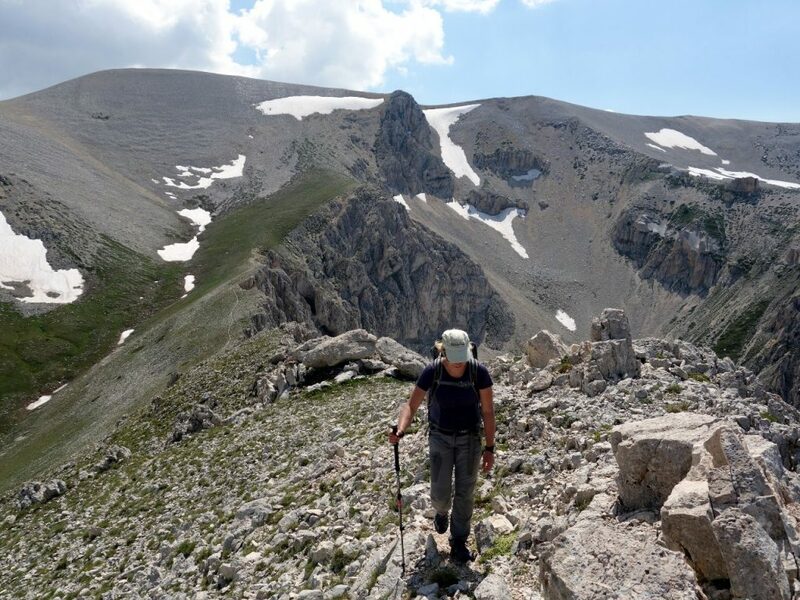 In its highest reaches Maiella, in the western part of the Italian region of Abruzzo, is a vast moonlike plateau, with over a dozen relatively indistinct, scree-clad summits rising over 2,500m in height. This area is most commonly accessed from the ski station of La Maielletta on its northern side. From there it’s a longish, but picturesque, walk along a pine-clad ridge. Monte Amaro is further still, up and down over ridges and cols for many hours, steps that need to be retraced. 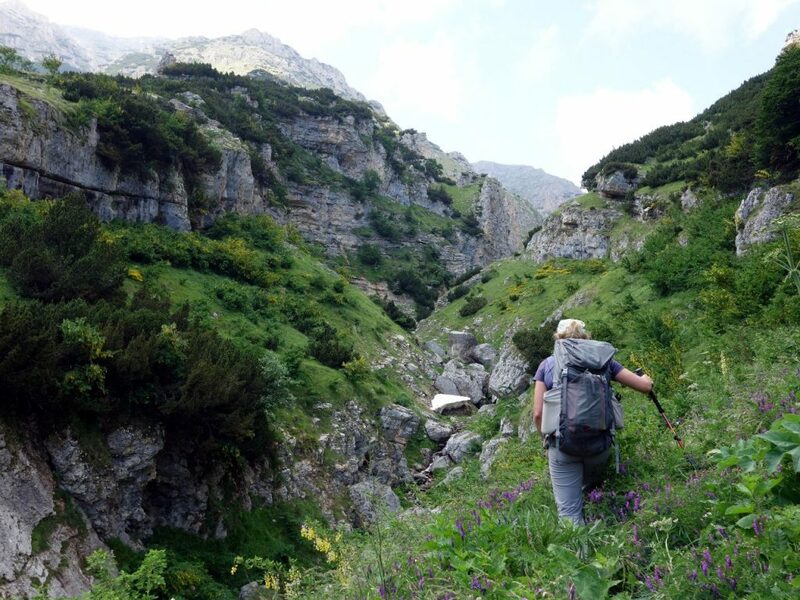 Few make it that far, choosing to climb Monte Acquaviva instead, because it’s not as far. We completed the long walk to Monte Amaro a couple of years ago, and then climbed it again from the west side, a much shorter and steeper route, in August last year. 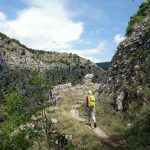 I wanted to climb Monte Acquaviva from the east, because I believed it would be a more unusual and quieter route. It was a spur-of-the-minute decision to go to Maiella when we looked at the weather forecast on Friday. I was at work, but Edita was working from home, so she took a photo of one of our 1:25,000 maps and sent it via Facebook Messenger. I could see a clear trail leading to the summit of Monte Acquaviva from the town of Fara San Martino on the eastern side. This was a part of Maiella we’d not yet explored, so we agreed to go there the following day. It wasn’t until I got home that evening and looked at the map more closely, that I realised Fara San Martino was at an altitude of 430m. This meant that to reach the summit of Monte Acquaviva, we’d need to climb 2,300m and come back down again. 2,300m in a day? This was considerably more than either of us had climbed in a single day before. Was it possible? There was only one way to find out. We could have made it easier for ourselves by getting up in the middle of the night and driving to Maiella to ensure we’d be starting the walk in good time. We were too stupid for that. It was a three-hour drive from Rome to Fara San Martino, and we left at our usual time of 7am. This meant that we didn’t start walking until 10.30. We were up against the clock right from the start. We had less than eleven hours to get up and down during daylight. This didn’t sound much for such a marathon climb. There was a spectacular opening to our walk up the Valle San Spirito. Quite literally. From the car park at Fara San Martino we stared into a gorge with giant cliffs towering on either side. These vertical cliffs were almost touching, and the opening between them was no more than two metres wide. We walked down a narrow passageway for about thirty metres, which opened out into a hidden paradise. For the next hour and a half we followed a trail through the steeply rising gorge. It was hot and dusty, and the sun beat down directly overheard. Twice we passed natural springs; we drank thirstily and refilled our bottles. We were grateful to enter the forest at 1,000m and get some shade. 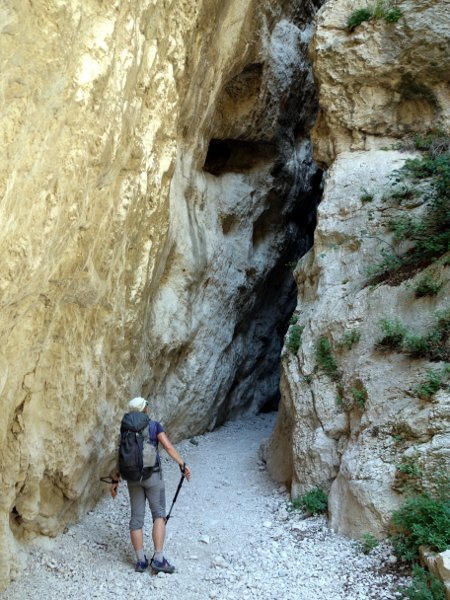 By midday we had ascended 700m, and reached the junction of paths at Bocca dei Valloni (“Mouth of the Valleys”). Here our trail turned right and climbed a hillside into the forest. We made good progress. Breaks in the trees provided glimpses back down the gorge, with the lowlands emerging at the far end. It was a satisfying climb, but suddenly there was a setback. There are probably worse things that can happen when you have to climb 2,300m in a day and have no idea whether it’s possible. You could fall and break a leg, or climb halfway and realise you’ve left the driver’s door unlocked and the car keys in the ignition. There could be an earthquake, not uncommon here in the Apennines. But as far as I’m concerned, what happened next was right up there with them. The trail started going back down again. Twenty metres, then fifty, then a hundred – a large portion of our hard-earned ascent, frivolously tossed away by a meandering pathway. Until that moment we were happy, and determined to reach the summit, but I knew it was always going to be touch and go whether we’d make it. My heart sank as we continued down, down, down, then back up again. When we reached a junction of trails, I took out the map, and saw how little progress we’d made. “There’s no way we’re going to reach the summit now,” I said. I may also have used a profanity or two, but I don’t remember clearly. It seemed a reasonable thing to say, but Edita didn’t like it. For the next part of the climb we walked fifty metres apart. I slowed down and dropped behind as I pondered Edita’s words. I expect you would call it sulking, but bitching? That would have been a fair comment if I’d said that her trail shoes didn’t match the colour of her trekking trousers, or that her water bottle was so last year. I didn’t feel like I was being negative, just realistic. It’s like when your boss gives you an impossible task, and you try to manage their expectations. But Edita has a different approach to impossible tasks, and as she sped off into the distance I realised I was going to have to run to keep up with her. We crossed a forest ridge and descended into another valley. The view opened out, and for a short time I had no idea where we were. We were among grassy moorland, and to our left I could see a part of Maiella’s moonlike plateau miles above us. We crossed a stream and reached a stone hut underneath an overhanging rock. It was two o’clock, and the hut had a picnic table outside. It seemed a good moment to stop for lunch. We were at a place called Grotta Callarelli, where the path forked. I looked at the map and could see that we had climbed 1,100m to an altitude 1,550m. This meant we had completed nearly half our ascent and around two-thirds of the horizontal distance. Was the summit on again? Alas, no. At this point, the trail that was clearly marked as G8 on the map vanished without trace. We didn’t help ourselves by heading up the wrong valley after lunch. The thick grassy undergrowth had been trodden down, so we followed it. But whoever went that way must have been as lost as we were. When we rose high above the river on precarious ledges, I took out our map again and realised our mistake. We retraced our steps, but there was no clear trail up the correct valley either. 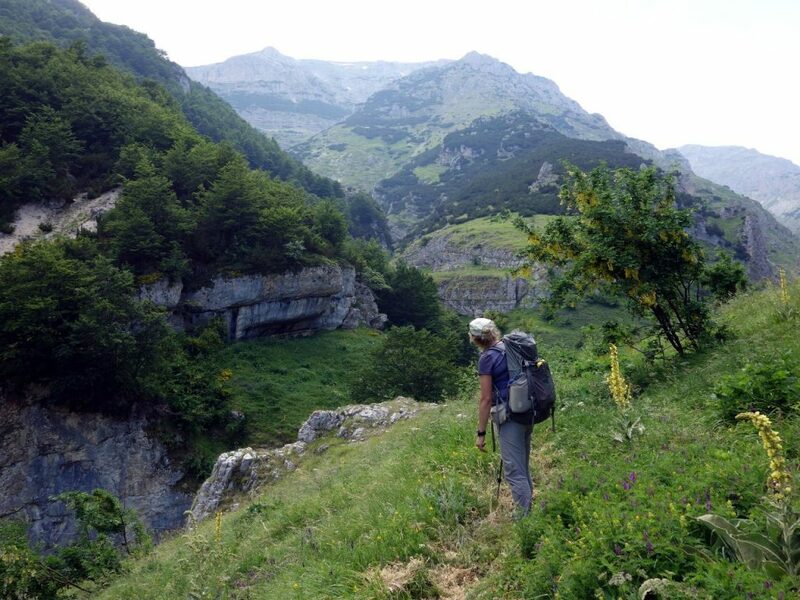 We identified the steep ridge above its right bank as the route up Monte Acquaviva, and headed up it. But soon we found ourselves in impenetrable pine thickets. Green pine dust engulfed us, and the most useful item of equipment would have been a machete. 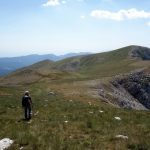 We could find no way past this natural barrier, and although the slopes were bare above it and the plateau at the top was probably Monte Acquaviva, it was now four o’clock, and there were still 1,000m to ascend. There may well have been a trail here once, but the pine thickets must have reclaimed it years ago. It was time for us to call it a day. Our return journey to Fara San Martino, was spectacular, and ample compensation for our struggles. We returned by the Valle Serviera, parallel to the Valle San Spirito that we ascended. But where we had ascended the latter along the valley floor, the trail through the Valle Serviera wound high above its floor – a real Himalayan trail clinging to the edge of a mountainside. 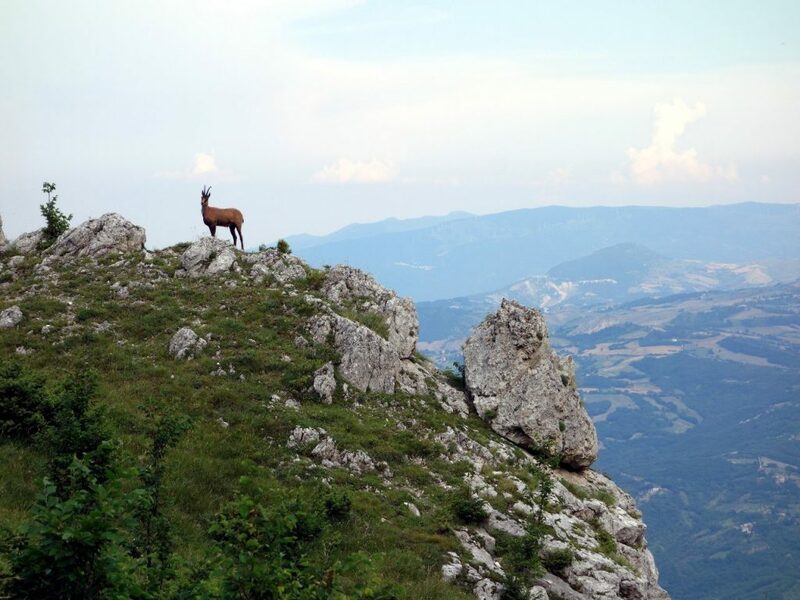 We even saw a camoscio (chamois) standing sentinel on a rock. All of our descent came at once, when we reached the end of the valley and had nowhere to go but down, a thousand metres all in one go. It was 7.30pm by the time we reached Fara San Martino. Our walk had lasted nine hours, and we hadn’t even made it halfway. We weren’t to be denied Monte Acquaviva that weekend. The following day we decided to drive up to La Maielletta on the northern side, and climb the mountain by its standard route. This would enable us to bag a few more 2,000m summits, look down the mountain into the Valle Serviera, and see if we could identify our route of the previous day. Some of you may think it’s cheating to climb a 2,737m peak by driving to 1,830m. But we’d started from the bottom the previous day, and if we add the two together then we can claim to have climbed the whole thing. Most Italians do their walking on a Sunday rather than a Saturday, so it was busy when we arrived at the car park beside Rifugio Pomilio. We started walking at 9.30. From that northern side, the ascent starts gently, along a pine-clad ridge. The two high points along this ridge, Blockhaus (2,142m) and Monte Cavallo (2,171m), are actually classified as 2,000m peaks. We didn’t know this when we first climbed Monte Amaro two years ago, and we passed beneath them without visiting their summits. We made up for it this time, but neither peak has a trail to its summit. Our ascent of Blockhaus involved another fight through a tangle of pine thickets. Some of you may be thinking that pine trees grow vertically, with plenty of space between the trunks. But here in Maiella they grow horizontally as small bushes, cutting off any way through. 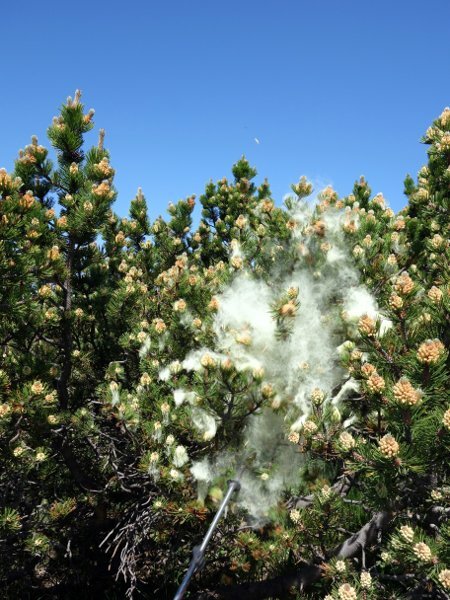 When shaken vigorously they give off a cloud of green pine dust, like a burst of smoke. We often saw these clouds rising from the hillsides below us, the sign of a wild animal, perhaps a fox or a deer, passing through. 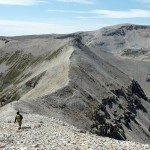 It took us about three hours to traverse the ridge and ascend to Maiella’s moonlike plateau. The pine bushes grew as high as 2,400m, but above the mountains were clad in grey scree. For the next three hours we walked along broad, bare ridges on the roof of the world. We crossed the gentle, rounded summits of Monte Focalone (2,676m), Cima L’Innominata (2,727m) and Monte Acquaviva (2,737m). We reached the last shortly before 2pm and found it crowded with hikers. We passed on, determined to find the ridge we looked up the previous afternoon and get our bearings. We descended to a rocky outcrop marked on the map at 2,593m, where we had our lunch. We could clearly see that we were sitting at the very top of the ridge we had tried to climb, where we had been stopped by impenetrable pine thickets. We could see all the way down to Valle Serviera, where we had walked on a high Himalayan trail, and to the lowlands beyond. All of it looked miles below us. It would not have been an easy ridge to ascend. Had we made it through the pine thickets, we might have reached the summit of Monte Acquaviva by nightfall. In fact, what we didn’t know was that Monte Acquaviva has a rudimentary summit shelter made from dry-stone walls. There is just enough space inside for two people. 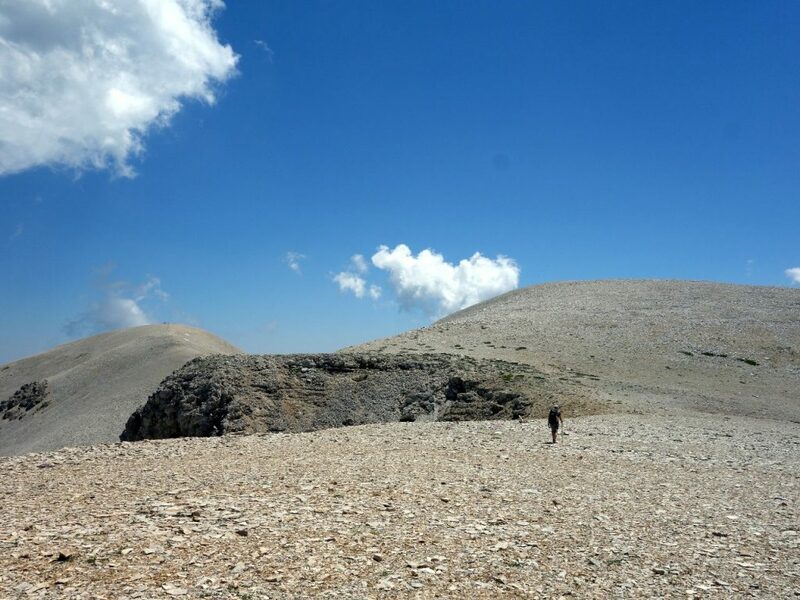 Those ascending by the enormous eastern route would have to stay the night on the summit and descend the following day. Despite its misleading name, however, there is no water on the summit of Monte Acquaviva. A more waterless wasteland would be hard to imagine. By the time we returned to the summit at 3pm, it was deserted. All the other hikers had gone back down, but we still had one more summit to climb. Cima delle Murelle (2,596m) is a more striking peak than the other summits on the plateau. It has steep cliffs on its western side, and a narrow summit ridge linked to the scree slopes beneath Monte Acquaviva. We soon discovered that the cliffs are a haven for camosci. There were dozens of them grazing on the grassy slopes on the east side of the ridge. As we approached they retreated up the ridge, looking for ledges to run down. Some of them climbed in front of us for a hundred metres. It was as if we had a cavalcade of camosci preceding our ascent of the mountain. Eventually they found places to retreat to, and we were alone again. The ridge was narrow and rocky, but it was more of a walk than a scramble, and I rarely needed to use my hands. It was 4pm by the time we reached our final summit, and we still had a long walk back to La Mailletta. Rather than returning the way we had come, we decided to scramble down Cima delle Murelle’s north-west ridge to a combe, the Amfiteatro delle Murelle. By crossing this combe we could join up with the pine-clad ridge that led back to La Maielletta. There was a clear scree trail down the ridge, but it eventually disappeared into grassy slopes, which we ran down to the combe. 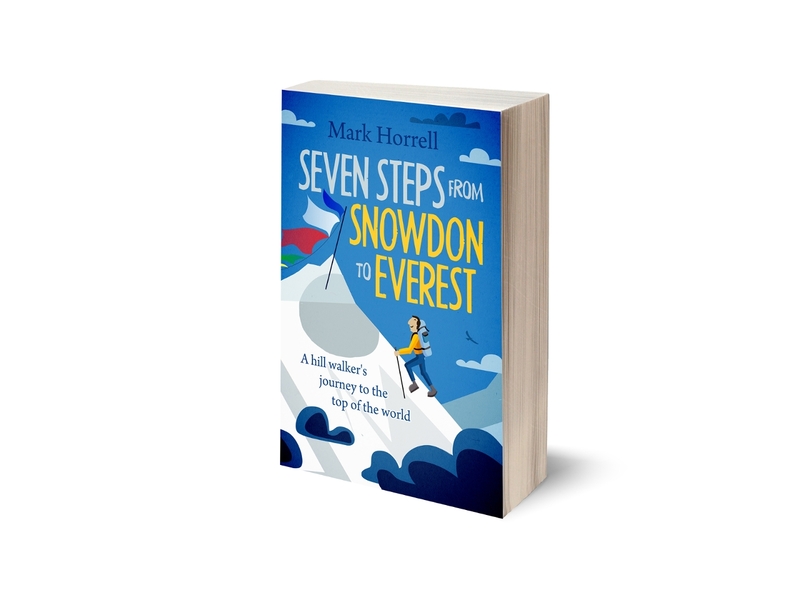 It was steep, but safe – the sort of hillside you look back up and think “how the hell did I get down there?” It’s not the sort of slope you would expect anyone to come down, which was how we came to surprise a naked man sheltering underneath a boulder. By the time we reached him he had put his clothes back on, and we could see that he had somebody with him. It was a handsome young couple. We asked if there was a trail back up the other side of the combe, and they responded politely. “La via non ovvia,” he said (the way is not obvious). “Quello là,” she said (that over there), pointing to some tracks that could have been made by a wild animal. Perhaps I’m naive, but it wasn’t until we were halfway up the hillside beyond that it occurred to me that she may well been in a similar state of undress when we arrived in the amphitheatre, and they had probably been shagging. It was a spectacular location for it, in a grassy dell surrounded by towering rock walls. With no easy trails to get there, you would expect to be able to complete your business without interruption. I’m sure they were more surprised to see us than we were to see them. We climbed up to the yellow hut of Bivacco Fusco, from where we looked back across the Amfiteatro delle Murelle, and most of the summits we had ascended. I hope it won’t be the last time I see the high peaks of Maiella, but it would certainly be as good a way to remember them as any that I can think of. We still had a long walk back along the pine-clad ridge to La Maielletta, but it was quiet now, and we could enjoy the late afternoon sun in relative solitude. 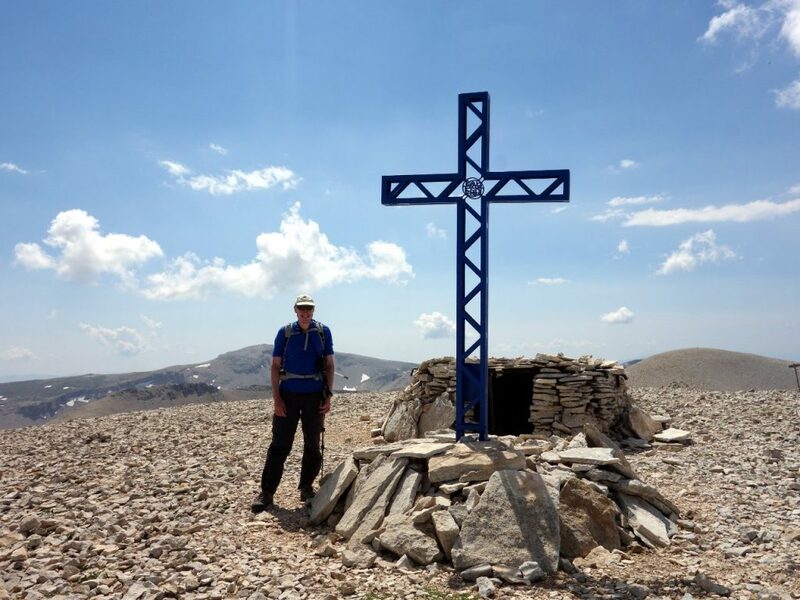 We reached Rifugio Pomilio at 7.30pm, a ten-hour Sunday to eclipse our nine-hour Saturday, and although it had started inauspiciously, we had achieved everything we set out to do, if not in the way we originally intended. Travelling is often better this way. It had been a good weekend, a true microadventure.